The aim of this expedition was to continue the scientific work begun on the British National Antarctic Expedition 1901-04, and be the first to reach the South Pole. Expedition ship Terra Nova sailed from London on 1 June 1910. They used ponies, dogs, and motorised sledges along with manhauling the sledges. Bowers, Cherry-Garrard, and Wilson were to undertake the first journey to be carried out during the Antarctic winter to collect penguin eggs. Scott, Wilson, Bowers, Evans, and Oates made up the five man team who made the fianl march to the Soth Pole but were beaten by the Norwegian Amundsen and his team. On the return journey suffering severe frostbite and realising he was slowing the others down Captain Oates was to utter the immortal phrase ‘I am going outside and I may be some time’ as he walked to his death in the hope the rest of the men would survive. Caught in unusually bad weather all five of the party were to perish on their return trip. A group of men who made up the northern party were forced to winter in an ice cave when the Terra Nova was unable to pick them up. Left only with a months worth of food the men lived off penguin and seal before sledging back to Cape Evans when the sun returned. When the fate Scott’s party was learned there was a mass out pouring of grief, a relief fund was set up to settle the expeditions outstanding accounts and care for the families of the Pole Party. The Scott Polar Research Institute in Cambridge was founded in memory of Scott and his achievements. Led by Robert Falcon Scott, the aim of this expedition was to carry out extensive exploration and scientific experiments including biology, geology, glaciology, meteorology, and geophysics along the coast of Victoria Land on the Ross Ice Shelf. They also aimed to reach the South Pole. It is probably one of the most well known Antarctic expeditions, popular literature has recorded that Scott was competing against the Norwegian Amundsen to be the first to reach the South Pole, the idea of a race to the pole continues to this day. 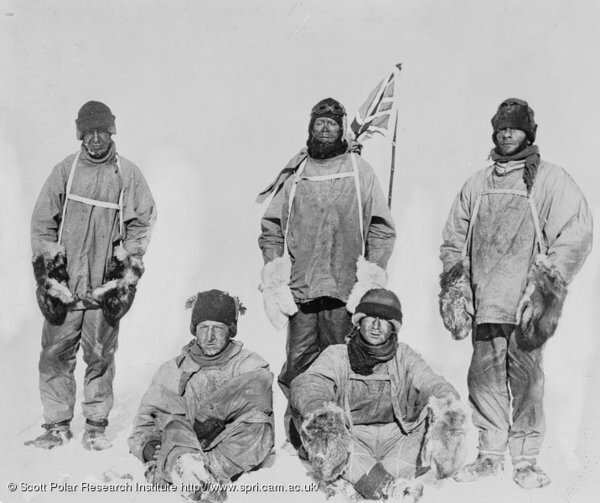 The expedition left London on 1 June 1910, sailing on the Terra Nova, it was only when the ship arrived in Melbourne, Australia that Scott learnt of Amundsen’s intentions to try for the South Pole. Until this point the world had believed Amundsen would be making an attempt on the North Pole, indeed Amundsen’s own crew did not know of the change of plans until they reached Madeira. The journey from Australia to Antarctica was a difficult one with the Terra Nova being battered by 55 mph winds. The overloaded ship was forced to throw ten tons of coal and 69 gallons of petrol overboard. The 17 Manchurian ponies on board suffered particularly badly, even with the constant attention of Captain Oates two of them died during the storm. The dogs also suffered and fighting broke out between them as the ship lurched from side to side, one dog died during the storm. The ship itself was in a bad way with the main pump clogged and the hand pump failing. Water rose and the furnace fires were put out causing the engines to stop. Engineers up to their necks in water finally unclogged the pumps. The ship was then delayed for three weeks by pack ice, which was much further north than had been expected. The Terra Nova finally emerged from the ice on 30 December to be hit by a blizzard. Scott had hoped to winter at Cape Crozier, however he found this blocked by ice so he set up camp at Cape Evans on Ross Island. On 4 January 1911 the men unloaded the ship as the ice deteriorated. The dogs proved difficult to handle and even worse one of the motorised sledges fell through the ice and was lost. The party worked to build a hut to winter in, measuring fifty feet by twenty-five, the hut was insulated with seaweed and contained a stove and cooking range. A partition was made between the men and officers quarters by staking supply crates to make an interior wall. When not working the men relaxed playing football and attending a variety of talks and lectures. The expeditions photographer Ponting would entertain the men with images from his travels around the world. The South Polar Times, an expedition newspaper set up by Shackleton on Scott’s earlier 1901-4 expedition was revived; this consisted of anonymously written articles of a serious or humorous nature. During the summer the men started laying depots for the journey south, as well as undertaking geological surveys of King Edward VII Land and an investigation of a region west of McMurdo Sound. This gave the men time to test out their various transport methods. They found that the motorised sledges often broke down resulting in them being unreliable. Concerns also developed about the use of ponies as they were struggling with the extreme cold and deep snow. Scott went out with 12 men to lay One Ton Depot, he was hoping to establish this at 80°S but was forced to cut short of this and a depot was laid 30 miles before this goal. The first Antarctic winter sledging trip left on 27 June 1911 with Henry Bowers,Apsley Cherry-Garrard, and Edward Wilson setting out for Cape Crozier. Their journey intentionally took place in winter so that they could observe the Emperor Penguins wintering and collect their eggs for observation. This was an incredibly tough journey, at one point the men were left exposed when a blizzard blew their tent away. Luckily, they were able to locate their tent the following day, had they not managed this they would have almost certainly died. When the men returned to Cape Evans on 1 August they looked exhausted and their clothes were so frozen they had to be cut off their bodies, however, some of their samples were still intact. Cherry-Garrard would later write the book ‘The Worst Journey in the World’ telling of the hardship of their expedition. The major sledging trip of the expedition was to be led by Scott in an attempt to be the first to reach the South Pole, on 24 October 1911 they set off. This trip began with three types of transport: the motorised sledges, a team of dogs, and a team of ponies bringing supplies. The motorised sledges broke down and both were abandoned by the beginning of November. The ponies did not fair as well as had been hoped, they struggled with the cold temperatures and small amounts of food. On 24 November the first pony was shot, by 9 December all of the ponies had been shot. At the foot of the Beadmore Glacier the Shambles Camp containing pony meat was set up. The dogs were a greater success than had been predicted, however, they had not brought enough supplies to extend their use further. On 11 December the dogs returned to Cape Evans and Scott and the rest of the men continued to man-haul the sledges along the Beardmore Glacier. On 3 January 1912 Scott chose Wilson, Oates, Evans, and at the last minute added Bowers to join him on the final strike for the Pole. Their journey was delayed by sastrugi, which made travel on skis difficult. On 16 January Bowers who had very keen eyesight spotted a black spot on the horizon, knowing this could not be natural they began to suspect the Norwegians had already made it to the Pole. On 17 January when they arrived at the Pole their worst fears were confirmed. Scott wrote in his diary ‘Great God! This is an awful place and terrible enough for us to have laboured to it without the reward for priority.’ They raised the Union Jack and took a number of photographs. The following day they began the trek home. At first they made good progress but slowly the effects of the cold and scurvy set in. They reached the upper Beardmore depot, from here they had a five day march with just enough rations, there was no room for manoeuvre. The weather was good and they stopped to collect 35 pounds of geological specimens in line with the scientific motivation to their expedition. They only just made it to the next depot, by this point Evans was steadily declining. On 4 February he took a turn for the worse when he fell into a crevasse along with Scott. It is thought that Evans hit his head and suffered a concussion, Scott describes him as being ‘broken down in the brain’. On 17 February Evans stopped to tie his boots, when he did not catch them up they skied back to find him. He was found on his hands and knees in the snow, he was put on the sledge and hauled back to the tent. Evans died at 12:30 am, likely from a brain injury brought on by his fall. Leaving Evans body behind then men trudged on, reaching the Shambles depot, here there was a supply of pony meat and the men could have a satisfying meal. They then continued onto the next depot but discovered the fuel had leaked and they were now short, on reaching the next depot the situation was similar but worst still here they were short of fuel and food. Oates was struggling very badly from the effects of frostbite, eventually his boot had to be cut just to enable him to get his foot in. The effects of frostbite were severely curtailing Oates’ speed and on 15 March he told the men ‘I am going outside and may be some time’, he left the tent and walked out into a blizzard never to be seen again. He gave his life in the hope that the rest of the party would be able to move faster without him. On 21 March eleven miles from One Ton Depot the three men made their final camp, where a severe blizzard prevented them from leaving their tent. They only had enough food for a couple of days and enough fuel for one hot meal. Trapped in their tent the men wrote their farewell letters to family and friends, Scott also wrote his ‘Message to the Public’ which outlined his reasons as to why the expedition had failed, blaming it on a mixture of the poor weather and bad luck. It is thought that Scott was the last of the three to perish. Scott’s orders had been that supplies should be taken by dog team to One Ton Depot for the return party. Cherry-Gerrard and Demetri arrived on 3 March and waited for a week, but were forced to return as their was not sufficient food for the dogs and Scott has ordered that the dogs should not be killed to feed each other. By April they knew that Scott and his party had certainly perished. The remaining expedition members passed another winter in the hut. A search party set out the following spring and the bodies of Scott, Wilson and Bowers were found on 12 November 1912 inside their tent. The search party collected the personal items and letters and then collapsed the tent over the bodies. A cairn was erected over the tent and a pair of skis used to make a cross. They looked for Oates body but were unable to find it and so erected a cairn in his memory. The search party brought back with them the geological specimens Wilson collected, and insisted they hauled them back even when exhausted. These specimens have been extremely useful in establishing the geological history of Antarctica. The support teams who had left Scott to continue to the South Pole had made it back to base, but they too had experienced a difficult return journey. On 13 January the last team to turn back – comprising of Edward Evans, Tom Crean and William Lashly – reached the Shackleton Falls, here they had a choice they could take a three day detour to get to the bottom, or they could rush the falls on their sledge. Lieutenant Evans who was the most senior man present asked the others what they would like to do, their reply being that as he was the officer he should decide. The glacier was rushed and whilst they were battered and bruised no bones were broken, this saved them a three day trek. Exhausted on the return journey Lieutenant Evans broke down with a severe attack of scurvy, on the 13 February he asked to be left behind, against his protests the rest of the team bound him to a sledge in his sleeping bag and dragged him for over 100 miles. When they could go no further they made camp, Evans was to stay in the camp with Lashly remaining behind to look after him. His other companion Crean would make a desperate attempt to reach base; if he failed all three would perish. They were almost out of food and so Crean took only a few biscuits and a little chocolate with him. After a continuous eighteen hour march Crean had made it to Hut Point and raised the alarm, Evans and Lashly were rescued and sledged back to camp. As well as Scott’s southern trip another sledging expedition had been planned. Led by Lieutenant Campbell, this party had gone northwards wintering at Cape Adare (1911) and Evans Cove (1912). Their intentions were to gather geological data, and a set of meteorological measurements independent of the main base camp. They spent several weeks near Mt. Melbourne carrying out geological work when the Terra Nova came to collect them. However, she was unable to get near the shore due to the close packing ice floes and having nearly been frozen into the pack was forced to give up relief efforts. The six men were stuck and where forced to unintentionally winter where they were, with only one month’s dried food as supplies. Their tents were too threadbare to last the harsh winter months and so they modified an ice cave, which they called Inexpressible Island. They lived mainly off seal meat, using an improvised stove and seal blubber for fuel. Due to the high meat content of their diet they did not succumb to the effects of scurvy, however, they did all suffer from food poisoning due to the dirty conditions of their cooking environment. It was an extremely difficult time for the men, but they maintained naval discipline, splitting their ice cave into an officer’s side and a men’s side, and passed the time reading to each other and giving lectures. They very strictly managed their rations, with a chocolate stick at the weekend and extra raisins on a birthday. In doing this all the men were doing as well as could be expected, when the sun returned they left their ice cave and began their sledging trip back to Cape Evans on 1 October 1912. They arrived back at Cape Evans on 7 November to discover the news of Scott’s Southern Party. When the Terra Nova returned with the news that Southern Party had perished there was a worldwide outpouring of sorrow. A memorial fund was set up which raised money to pay the men’s widows and clear the debts of the expedition. Enough money was raised to found an institute in Scott’s memory; this was the Scott Polar Research Institute (SPRI) which still carries out polar research today. Scott’s Last Journey. Gerald Duckworth & Co. Ltd. Scott, R.F (1913) Scott’s Last Expedition Volume One Scott’s Journals. Macmillan and Co Ltd. Solomon, S. (2001) The Coldest March. Yale University Press. The Scott Polar Research Institute has made a catalogue of it’s Polar Art Collection accessible online. The art collection features artworks by explorers such as Edward Adrian Wilson, and Apsley Cherry-Garrard. This entry was posted on Wednesday, November 5th, 2008 at 4:23 pm	and is filed under Antarctic, British Antarctic Expedition 1910-13. You can follow any responses to this entry through the RSS 2.0 feed. Both comments and pings are currently closed.